The urban transportation problem is a hardy perennial: no matter how many lanes we add to urban freeways, traffic congestion is just as bad, if not worse than ever. In the face of “free” road travel, induced demand means that supply side strategies like widening freeways simply encourage more people to drive, and congestion gets worse. Houston successively widened its Katy Freeway to 23 lanes, but only found that congestion got worse and travel times got longer. Fortunately there is a solution: peak-hour road pricing. It’s been successfully implemented in cities around the world, from London, to Singapore, to Milan to Stockholm. Charging a modest price for the use of roads at the peak hour encourages a small fraction of drivers to change their route or mode, with the result that traffic levels and travel times improve for remaining users. And while there’s always skepticism and resistance to charging for something that everyone pretended was free, once these systems are put in place, they have broad popular support because they actually make travel better and easier. Stockholm’s system was initially opposed by the public, but after six months of operation, was approved in a popular referendum by 51 percent; today more than 70 percent of Stockholm residents support the system. The economics of this problem are simple and straightforward: as long as we charge a zero price for the use of scarce and valuable peak hour road capacity, more people will use it than it can handle. Ultimately, we end up rationing road space by the degree of road user’s desperation and their tolerance for delays. As we’ve suggested at City Observatory, it’s as if we’re trying to run the urban road system the way Ben & Jerry’s runs their ice cream business the one day of the year that they give cones away for free, and with similar results: People line up around the block for “free” ice cream, which is actually only available to those with the patience to wait long periods in line. There’s no way for Ben and Jerry’s to build enough ice cream stores to meet the demand for free cones–and free ice cream everyday would soon bankrupt the company. This is one instance where charging a price for a “free” good will make things better for everyone. Here are two important things to keep in mind. First, not everyone attaches the same value to a peak hour roadway trip. Second, traffic is non-linear. Here’s why these things matter. One working assumption seems to underly popular discussions about peak hour travel: It’s that somehow everyone who is using the road now “needs” to be on the road at that time. But in fact, a big fraction of travelers have options. They could travel at a different time (a little earlier, or a little later), they could take a different route or mode (like bus or bike), or they could combine or re-route trips. Some people would find it just as convenient to travel at a different time or to a different destination, and while others might forego a trip altogether. Perhaps a majority of those currently traveling at the peak hour would find it difficult or inconvenient to change, but many people could be flexible, if they had the incentive to do so. They key question is how many people would have to change their behavior to get a positive result. That’s the second key fact: The answer is that only a few people would need to forego current peak hour car trips to get a big improvement in congestion. A critical feature of traffic congestion is that it’s non-linear. What that means in practice is that roads work really, really well, right up to the point where they get congested. A highway with heavy traffic moving along at 45 to 50 miles per hour carries the most vehicles of any roadway. But add just a few more cars, and the traffic level reaches a tipping point, where things slow down, and the road actually loses its ability to move people. The key to making roads work well is to keep them just below this critical tipping point. The good news here is reducing traffic volumes just 5 to 10 percent is all that is needed in many instances to keep the roads moving. We’re not talking about big charges either: in most cases, modest toll levels trigger big changes in commuting patterns. Louisville, Kentucky recently started tolling the I-65 crossing over the Ohio River. Regular commuters pay a toll of $1 per crossing; and tolls have reduced the volume of cars using the I-65 crossing by more than 40 percent. 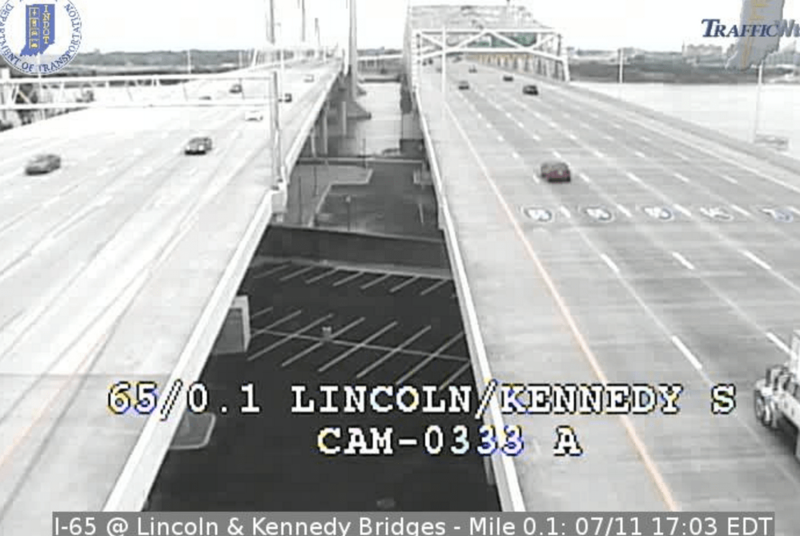 Today, you encounter almost zero traffic at rush hour leaving downtown Louisville. (As it turns out, Louisville wasted roughly a billion dollars widening this bridge, because they doubled it’s capacity before levying a toll; if they’d tolled first, they would have discovered they had plenty of road space). So to make our roads work better, all we need are tolls that persuade maybe one in ten travelers to change their behavior. And that’s what peak hour pricing does: sends a signal to those people who have alternatives or who least value traveling at that time on that route, to do something different. The result is that every other traveler gets a big benefit in terms of improved performance. A well-designed system of road pricing could be an enormous win-win: It would shorten travel times, and actually improve the carrying capacity of the highway system. It would eliminate the need for expensive, environmentally destructive and usually wasteful road-widening projects. The funds from road pricing could be used–as they are in London–to fund other transportation alternatives. There’s really no such thing as a “freeway,” and a correctly priced road system would be better for all of us.